Any kind of medicine has to find a balance between cost and benefit for the patient as well as for the society. Personalized medicine is no exception and also has to operate under the same limitations. There is inevitably a clash between ethics and economics as putting a monetary value oil human life or health is clearly difficult decision. Here, I will focus as far as possible on the economics side of the equation, which is difficult enough. 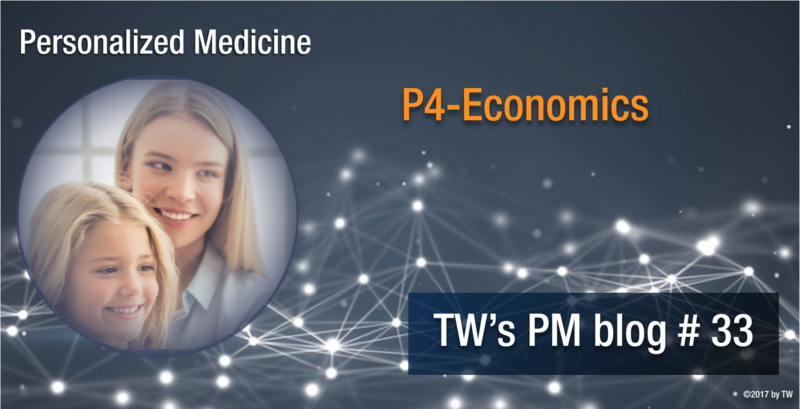 The promise of P4-medicine is to increase health and wellness first hand causing a reduction in treatment costs as a result of avoiding or delaying the onset of diseases. Which illustrates one of the biggest problems in the economics of personalised medicine: Pay now (more) to save later. This concept does not rest well with CEOs of companies, governments, politicians, or health care payers bound to realise any benefits during their current term. Basically, there are two subgroups here, the professional economists. Those working at heath care insurers, the government, or large hospital groups, trying to manage health care like an industry. And there are the myriads of involuntary economists such as the practising MDs. They need to make ends meet in their daily practice of financial balancing between effort, expenses, and income. Many decisions small and far-reaching about the development and deployment of personalised medicine are actually influenced or even dictated by economic considerations. It is difficult to accept seemingly unnecessary expenses for prophylactic measures and test which might pay back decades later. Whoever makes such decision will have to defend the increase in cost now. On the other hand there is little to no chance of reaping in the benefits during their term of professional life. Medicine and personalised medicine are a bit better off in that respect than environmental protection programs. These get very little help from ethical considerations as their effects do not directly influence the health and well-being of the currently living generation. In contrast, personalised medicine’s promises are meant for the currently living generations to be realised in part today (better treatment) or within one generation (decades). In both cases ethics play are much more prominent role. Denying generations to come a heathy environment is much easier to accommodate than denying treatment to a patient TODAY. Economists can only help the development of personalised medicine when they carry out really forward looking modelling. Just looking at the effects on the budgets of the next and the 4 years after that is not enough. We must at least take one generation (about 20-30 years) into account. Only then will savings from preventive programs become tangible. The very best they can do is Pointing out that just accepting the inevitable increase in cost for conventional disease-oriented treatments is short-sighted. Showing the potential of a P4-approach in various scenarios illustrates a viable alternative. The same as the major roles. Development of economic models that show the influence and consequences of various scenarios is necessary. They should emphasise no-change scenarios as well as a number of potential P4-scenarios with different focus. This will provide the numerical basis for politicians and health care insurers upon which to base future-oriented decisions. Any treatment of terminal caner patients prolonging their lives (and thus treatment periods) by personalised medicine will inevitably increase costs. Under that focus personalised medicine becomes an unbearable cost-driver making its large-scale implementation look like an utopia. That is quite different If the focus is on the balance between preventive measures and money saved later on. Saving come from NOT having to treat the current amount of chronic diseases. In such cases personalised medicine looks more like the shiny white knight saving not only our heath but our wallets too. Of course, as with any kind of assumption-based modelling the final proof is in the pudding. However, it is easier to convince decision makers if they are at least given some ballpark-numbers considered halfway reliable. Money goes around also in health care and wherever money is involved, economists are too. Whether pharmacies fill prescriptions, a MD performs a medical procedure, you enter a hospital or receive a flu-shot. There is always a price tag attached to everything. Hoewever, not getting a flu-shot may also have a steep price attached: being incapacitated for two or three weeks including the much increased risk in the elderly population for succumbing to the disease. Economists have a major influence on every stakeholder in personalised medicine responsible for shouldering medical costs. Politics (e.g. think of the raging battle about Obamacare), health care insurers as well as their immediate customers. These are not the patients but the hospitals, pharmacies (as selling outlets of the pharma industry) and MDs as these groups are mainly payed. However, economics also plays a role in winning the support of patients or all of us to directly should part of the cost by patient contributions. 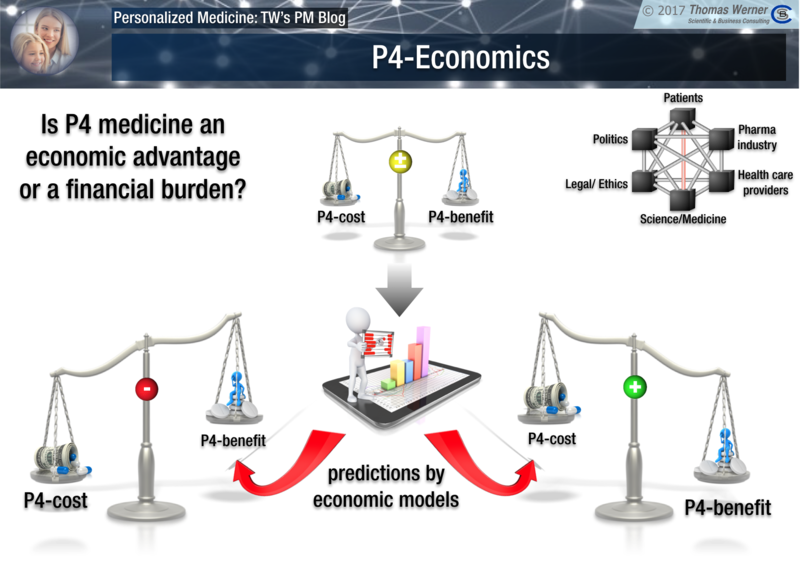 Trying to get realistic data and prognostic trends regarding the major cost-driving and cost-saving factors in personalised medicine. Then building models that explain the current situation as closely as possible and extrapolate various scenarios. If such models show cost-saving only after several decades, so be it. The main point is to make clear that personalised medicine is not just a costly adventure never paying off financially. I do not believe this pessimistic view to be true and we all will have to rely on economists to illustrate the financial effects of potential scenarios for the future. Next week we will come to one the pillars of innovation in personalised medicine: scientists.